Haymeadow Park will contain several new learning features for young kiers such as Smarte Terrain and Ske-cology courses. Following the debut of Red Buffalo Park during the 2017-18 season, Beaver Creek Resort is building on its reputation as a family resort by debuting a second dedicated learning area for the 2018-19 season. Haymeadow Park, as it will be called, will focus on terrain for beginners of all ages. At the heart of Haymeadow Park is a beginner gondola and lift, plus adjacent magic carpets. Terrain improvements include a dedicated learning area with a beginner racecourse, Buffalo Bumps and Berms and Ske-Cology environmental learning. Haymeadow Park amenities include culinary delights such as a new Ice Cream Parlour offering ice cream novelties and a quick soup and sandwich lunch. An exclusive, secure lunch area for children’s Ski School students is also provided at The Ranch. For more discerning palates, guests can enjoy gourmet, ski-in lunch service at SaddleRidge Restaurant renowned for its gourmet Colorado cuisine featuring sandwiches, soups, salads and Old West favorites. New this year, Beaver Creek will debut The Ice Cream Parlour, a vintage ice cream shop located inside The Ranch, at the top of Haymeadow Park. The restaurant will feature ice cream by the scoop, hot and cold beverages, signature treats such as the a milkshake and Beaver Creek’s famed chocolate chip cookies. The Ice Cream Parlour is a great place for all ages to warm up with a quick soup or sandwich lunch, or find a delicious treat during a day on the slopes. The Parlour is accessible via the Haymeadow Express Gondola, which is free to ride on foot. Accessed by ski or snow shuttle from Haymeadow Park, this unique slope-side restaurant is renowned for its gourmet Colorado regional cuisine sandwiches, salads and Old West favorites such as trout and chicken fried steak. Found only on the slopes of Beaver Creek, SaddleRidge houses one of the largest private collections of Western artifacts in the United States, outside of a museum. Ralph Lauren designer Naomi Leff organized the decor of the restaurant’s interior in 1987. To this day, the restaurant is full of Wild West artifacts such as an original portrait of George Washington used as a proof for the dollar bill, Native American beaded moccasins and pouches, General Custer’s hat and canteen, Native American headdress and Buffalo Bill’s desk. With a vast selection of worldly wines and champagnes and an extensive drink list to choose from, guests are invited to discover the perfect pairing for lunch. The Ranch, located at the top of the Haymeadow Express Gondola, is a lunch spot exclusively for children enrolled in Beaver Creek Ski & Snowboard School. Enrolled children will take a break to refuel in this kid-friendly space that offers a full menu, frozen yogurt bar, healthy morning snacks and afternoon cocoa breaks. Learn to ski on new features in Haymeadow Park such as Buffalo Bumps & Berms and Smarte Terrain. Smarte Terrain utilizes man-made and natural snow features to improve the learning experience for first-time, beginner and intermediate skiers and snowboarders. The concept is based on a natural progression using features that create an environment of exploration, learning and fun. Ske-Cology educates youth about mountain safety and mountain ecology. 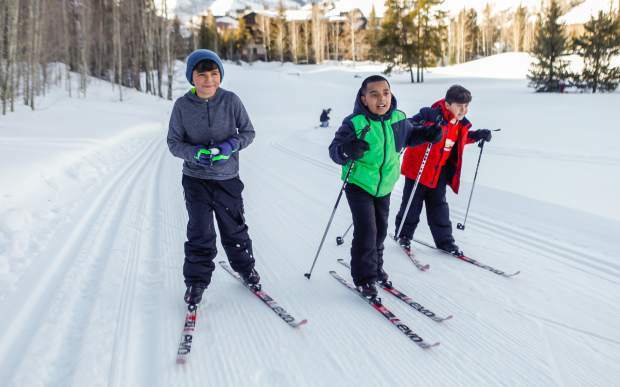 Ski to designated ske-cology landmarks within Haymeadow Park to learn about Beaver Creek’s ecosystem and endemic wildlife. Ski in for story time with Jack Rabbit Joe and Sheriff at The Ranch on Sunday and Tuesday afternoons at 1:30 p.m. and join in on Ripperoo’s Parade every Monday at 2 p.m. from The Ranch through Haymeadow Park. Haymeadow Park’s grand opening celebration is scheduled for Thursday, Dec. 13 through Sunday, 16.